I have been reading some truly captivating and thought-provoking books lately that I am just itching to tell you about. Two that I will tell you about now provided hours of delightful reading for me, some of the best I’ve had this summer. Both are well written and colorful. One is serious nonfiction, the other a rather playful and deceptively simple novel; both were compelling and entertaining. The first is Beth Macy’s Factory Man: How One Furniture Maker Battled Offshoring, Stayed Local – and Helped Save an American Town, a civic-minded, decent, wide-ranging study of Southern furniture manufacturing and the way one “factory man” with sawdust in his veins, fought to resist Chinese imports after a decade of plant closings in Appalachian southern Virginia and North Carolina, while the other carries the goofy title The Jesus Cow, the first novel by a memoirist and essayist Beth and I both adore, Michael Perry. 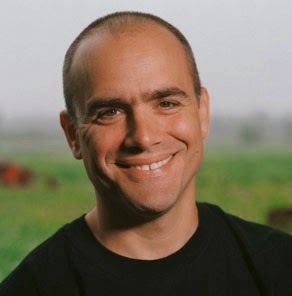 You may know him from his nonfiction, small town storytelling such as Population 485, Truck, Coop, and Visiting Tom all set in his native Wisconsin. The first is careful, journalistic storytelling, building background, telling the multi-generational tale, is very well footnoted, as a good expose will be, and truly important. 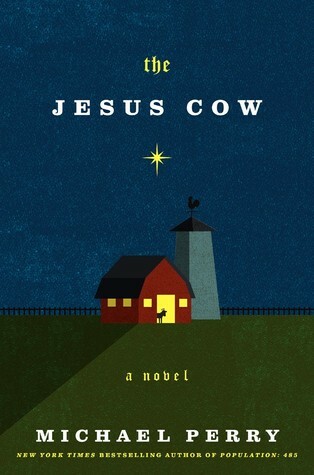 The second is a funny novel, good-hearted and well written and truly wonderful if you like farm jokes, religious satire, and small town intrigue, set out just beyond the new off-ramp by the interstate. From Factory Man’s setting of small town Southern Virginia (including the lives of the poor, the working class, as well as the Plantation-culture millionaires) to the Northern Wisconsin farmland around the fictional town of Swivel, Wisconsin, these two books complement one another somehow. Okay, maybe that’s just in my imagination, but I still want to tell you about them both together, mostly because I read them back to back, but also because, well, I just want to. Perry’s first book, Population 485, about being an EMT, was full of wit and kindness and struck some of us like a workingman’s Garrison Keillor, telling colorful stories about “meeting your neighbors one siren at a time.” It was clear in that first book that he was a good wordsmith, a smart essayist, combining rural cleverness and subtle (well, not always subtle) social criticism. Maybe he’s like a Gen X Wendell Berry, who works with cows instead of tobacco and whose politics are all grange-hall and county fair localist, with a few more colorful characters then you’d find in Port Williams, KY, even if it was a real place. Perry’s non-fiction books make it clear that if he showed up in the Factory Man scene, if he ever stepped foot in a Henry County sawmill or middle-brow bedroom suite plant in Bassett or Galax, Virginia, he’d be in his element for sure, handling tools and conveyor belts, despite his nasally Northern accent. From his essays and memoirs we know that Perry likes him some solid, literary rock, so he might even like it that Beth Macy uses as an epigram in Factory Man a song about plant closings by Americana roots singer-songwriter James McMurty, son of popular Western novelist lonesome Larry McMurtry. So, they are two very different books, about two different times and places, one of eye-opening, investigative journalism, and one true in a sense that only good novels can be true. Although I feared losing fingers when I worked in a saw mill for a bit one summer, and even now live in a small town culture that is to some extent gutted of an earlier industrial influence (the huge garage across our back ally that burned to the ground last winter had been years ago a tobacco drying shed for the legendary cigar making industry in these parts) and some of our own relatives are small town dairy farmers, I must say that both books introduced to me, perhaps again through fresh eyes, new insights about the ways and means of small town America. Both books are exquisite in detail and while Jesus Cow is obviously light fiction, Factory Man is straight narrative nonfiction, with Macy, an award-winning journalist (herself the daughter of a rugged and eventually disemployed factory man from Ohio) telling the story of her research of the family dynasty that created the furniture making empire that became the world’s largest manufacturer of wooden bedroom suites (and more!) Her story starts with an ancestor who was on an early Mayflower era ship, but starts in earnest in the early 20th century as the small town of Bassett, formerly Horsepasture, Virginia. The story traces how Bassett is developed into a company town, from the rise of the Bassett family sawmill by the Smith River that exploited the need for railroad ties and turned into a major industrial powerhouse in the first half of the 20th century, really hitting its stride during the Lets Make a Deal post-war baby boom housing boom. Factory Man‘s epic story ends approaching the middle of our current decade and the fourth generation of the Bassett dynasty, as John D. Bassett III, who Macy calls JBIII, travels again and again to China to investigate mile-long factory plants and spanking new warehouses underwritten by commie-capitalist incentives to under-price their exports, and then to the shiny, marbled floors in Washington DC to lobby for, and eventually win a major lawsuit about international imports, China’s “most favored nation” trade status, GATT treaties and what is called “dumping.” I have to say that at the end of the lengthy book I wanted still more – the story was that good! Both authors, Macy & Perry, are stellar writers, excellent at their craft. Macy is breathtaking in her accumulation of data and anecdotes, and her ability to frame the episodes by a larger, culturally-significant narrative, which is, in a tongue-in-cheek way, what is also going on in the Jesus Cow novel and the antics of the farmer whose latest calf is birthed with a plain-as-day picture of Jesus on its hide. The plot thickens as his friend convinces him there is money to be made from the religious pilgrims that will inevitably flock to see the Jesus Cow, and as a small town developer with Big Dreams for Progress sees his own profits and influence at risk, the aforementioned tongue-in-cheek culturally-significant narrative becomes, well, as plain as the icon on the cow. It is much, much more complicated, especially in the real life story, but much of these stories are, to cut to the chase, about Mammon. Macy is a mostly a straight-forward news reporter, a fine and engaging writer, investigating this angle, that side story, exploring questions of race and class and poverty and profiling big-wig characters who are larger than life, even as she interviews the aging African-American “help” of these barons of business, also talking with retired secretaries and sales reps and competitors and small town mayors and hardware store owners and the like, to get a very multi-layered and big picture story of big business in small towns. From the black chauffeur drivers of the corporate owners to participants of back-room, cost-cutting deals of the plant managers, from players at the annual national trade shows to attorneys at white shoe law firms working on NAFTA laws, Macy unearths more than you can imagine. She makes it all so incredibly interesting, and, to her credit, regularly gives voice to the marginalized with honest, gripping detail. The author’s brightly written, richly detailed narrative not only illuminates globalization and the issues of offshoring, but succeeds brilliantly in conveying the human costs borne by low-income people displaced from a way of life… A masterly feat of reporting. The raves about Factory Man seem unending, and Macy is likened to the best nonfiction storytellers of our day, such as Michael Lewis, Katherine Boo, and Tracy Kidder. 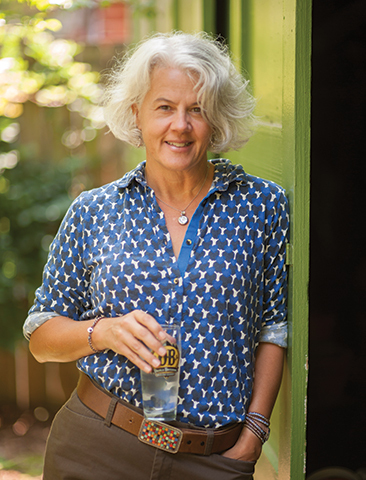 Ms. Macy has an obviously big heart for these concerns, and has been reporting on Appalachia for twenty-five years. Factory Man itself was years in the making, and readers will admire her tenacity. She tells of her own brave investigations (hours and hours of meetings, traveling far and wide to do even off the record conversations, sometimes discouraged by cancelled interviews – one CEO put her off for a whole year before he’d consented to be interviewed — enduring hundreds of phone calls, trips all over the globe) and it makes for a gripping page-turner. There is much to learn from this complicated story. 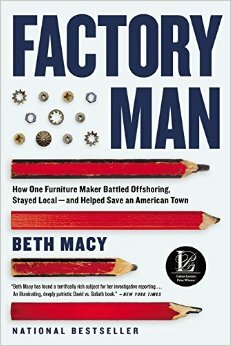 I cannot do justice to the epic story here, but want to offer five take-aways, reasons BookNotes friends and faith-based communities ought to read Factory Man: How One Furniture Maker Battled Offshoring, Stayed Local – and Helped Save an American Town. Maybe noting these themes will persuade you or your book group to discuss and ponder. The first is simple: this is a great read! It is a great thing to lose oneself in another world sometimes, and this is one heckuva world. With the racism of antebellum and Jim Crow South (there are more blacks in the mills and factories of Virginian than in North Carolina, say, because there were more slaves in Virginia and the legacy endures) and the class tensions under it all, this reads like some mash up of Harper Lee and Norma Rae. I think the telling is illuminating and tender – I dare you not to be moved by some of the regret that pervades some of the episodes – and spending some days in these small towns among these older timers is good. You could get lost in this place. I am sure you’ll be entertained — it has been optioned for a film, by the way — and you will also learn and feel much about small town life. I’m sure it comes as no surprise to you that we don’t make much on book sales – how much dough can one take in on a fifteen buck book offered at discount? – but I was nonetheless captured by the stories of these products being developed, the marketers going to big, fancy trade shows, the work of sales reps calling on retail outlets, and the actually work of selling stuff on the sales floor, the fears of losing sales due to competition, fair and unfair. Although this is mostly about the Boards and owners of the manufactures, it is finally about selling stuff, so I was eager to learn how other industries do that. This book made me think about my own work, and I think it could be helpful for you, too. WHAT SHOULD WE DO ABOUT CHEAP LABOR IMPORTS? And, of course, the largest, looming backstory of this saga is the way importers, using low cost labor and off shore benefits (no Chinese EPA sniffing at the glue they use, just for one tiny example), can sell below typical costs, literally putting the local manufacturers out of business. Some of these Chinese, Indonesian, or Vietnamese factories didn’t even care if they made money at first, they just wanted market share – driving out the little (or even not so little) guys stateside. It isn’t an exact parallel, but I thought about Amazon and Cokesbury and Borders and our own fight to stay afloat on every single page. I was disappointed that Macy – despite her obviously good heart and fair-mindedness, wanting to get all angles of the story right – never reflects upon the obvious questions about what we might call “fair trade” or “ethical sourcing.” That is, she shows how third world nations are able to cut costs by using cheap labor, and by avoiding environmental care, but rarely exposes what that looks like in terms of the global slave trade, oppression and violence against workers, and environmental degradation in Asia or Latin America. Her discussions about the costs and/or benefits of global trade were framed mostly in terms of economics and jobs, what floats the most boats and the like. I would have wished for a clearer awareness of the human and ecological costs of bad business practices in places like China. I will note shortly that, without much of a stretch, humorist Michael Perry is getting at a similar sort of concern about sustainability, local work, the meaning of development and progress, even how faith does or doesn’t underwrite such small town concerns. Hold on. There has been a discovery in the last few years – thanks be to God! – about how Christian folk should be taking their sense of calling and vocation, and hopefully their Christ-like compassion and ethics, into the workaday world. We here at Hearts & Minds have been (if we can be so proud) cheerleaders for this high calling of faith in the workplace, perhaps one of the only theological bookstores in the country with a specialty of helping congregants serve God in their secular callings and worldly careers. (I’ll try not to overdo my rehearsing of this, that we stock books about Christian perspectives on math and science, film and art, engineering and medicine, education and business, counseling and politics, helping the people of God relate Sunday and Monday, worship and work, etcetera, etcetera.) However, it seems that many of our best books about faith lived out in the marketplace are for professionals, and are a bit abstract about “thinking Christianly” (which I maintain, obviously, is essential) without offering adequate guidance about practices on the ground, facing up to the real world of factory floors, shops and cubicles, supply-chains and spreadsheets, layoffs and plant closures. Do any of the many books on a Christian view of work that we so admire and promote, really push us become agents of change within the institutions where we are employed? To become even whistle-blowers, perhaps? Factory Man documents some pretty ugly racism, sexism, even sexual harassment on the job. There are many nuanced ethical quandaries facing workers and although a few of the factory-family leaders in these several towns attended church somewhat (Baptist and Methodist, Macy tells us) nobody seems to bring much leavening faith to bear on the ethics of the workday, let alone offer prophetic spiritual wisdom about the globalization crisis facing the larger market. I do not think that Macy was “tone deaf” to this, just failing to report about their spiritual lives, I rather suspect that the Bassetts and the Vaughns and the others were mostly just crass capitalists and nominal church folk without an interest in, let alone stomach for, taking faith to the factory floor or board room. So that’s reason number four: with all our talk about faith in the work-world, we need to know well the real quandaries of real workers in this globalized market economy. Factory Man puts you there, in the grimy details of building, profiting, losing, and in some small way, regaining productivity in ways that respond (for better or worse, well or poorly) to God’s call for people to make something of the world, and to be busy with the work of our hands. This book can really help those of us who talk about this stuff get real – like Studs Terkel’s revealing collection of interviews, Working, did decades ago, or like the more philosophical The Pleasures and Sorrow of Work by Alan De Botton did just a few years ago. Fifth, (but don’t fear the G-word): globalization. This fascinating book not only helps us understand small town, industrialized American folk, oozing a sense of history and place, and helps us understand the workplaces and work-world of many (owners and employees, investors and managers) but it also offers a fascinating glimpse into international trade, the WTO, the myriad ways in which the new “flat” world (extolled in almost idolatrous enthusiasm by Thomas Friedman) affects us all. (Buy a new chest of drawers or rocking chair or kitchen counter, lately, by any chance?) Further – and this is so valuable — there is a helpful glimpse of how politics fits into all this. The (supposedly) nonpartisan appointees of The U.S. International Trade Commission and the U.S. Department of Commerce play significant roles in setting policy, and in the very exciting last portion of the book, their role becomes at least a little more evident. And there’s stuff like this: one of the Bassett family dynasty left the furniture industry to get involved in politics: doncha think having one of their own as governor, and then State Senator, helped just a bit? You’ll read exactly how it did! Is this good, or bad, or a bit of both? Ends up one of these politicos got the feds to invest in Norfolk as a harbor port, and as the expansion of the industrial shipping methods known as container vessels developed, ships could arrive and depart from Virginia, not only Baltimore, Philadelphia or New York City. This is a small but telling part of the narrative arch of Factory Man, made more notable because Macy’s first chapter tells of some enterprising Bassetts who convinced the fledgling Norfolk and Western Railway to change the route of the railway, in ways that obviously were essential for the success of their business. Don’t let anybody tell you that most business tycoons don’t like government involvement in their industries. They thrive on it! This is truly entertaining stuff – especially if you like a little history and a little sociology – but it importantly reminds us (by just telling the story of how the sausage is made, so to speak) of very significant stuff. Except for exceptionally ideological libertarians, nobody eschews “the government” being involved in business and economics. Roman Catholic “small is beautiful” subsidiarity teaching, and Dutch Reformed Abraham Kuyper’s “sphere sovereignty” notions are just two different theological models for how to discern what and how government might be involved in the economic sphere for the common good, but there it is: this book brings any abstract talk you’ll hear during election debates about restraining government’s role in things down to reality. I know some of the Republicans say our economy tends towards socialism, but this is nearly silly. Most big business players lobby very hard for government involvement – which may or may not be a bad thing, as this book makes clear. So there’s reason number five. Who knew that learning a bit more about politics and economics could be so much fun? Okay, a sixth reason to get this lovely, informative, epic book. Through the first two thirds of Factory Man you’ve learned so much about so much, you’ll be itching to look up small towns in North Carolina on Google Maps, maybe even going to the library to find obscure historical society reports from Depression era Virginia. But there’s more, a lot more, captured in that pretty nifty subtitle of this book, How One Furniture Maker Battled Offshoring, Stayed Local -and Helped Save an American Town. The good-old-boy JBIII is no saint – that become clear on page one of chapter one. And he taunts and bellows and exhorts Ms Macy in ways that might have made a more timid author back away. (And, man, can Bassett, and all these genteel good old boys trash talk!) But she, and you, will grow to admire him, even if his rather exotic plan about suing over an obscure portion of the WTO treaty is quixotic, and even if, at the end of the day, it doesn’t really save a town, let alone an industry. This is legendary David vs Goliath stuff, and the plot of what could be a great movie. There’s drama as we learn how industrial espionage happens, including the work of a Taiwanese spy, even as dramatic trips are made on “the dusty road to Dalian” in Northern China, nearly to the Korean border, searching for a certain factory that is making a certain knockoff of a Vaughn Bassette bedroom suite. (Which was itself a contested knockoff of a competitor’s bedroom suite, which was itself a knockoff, or at least a copy, of a classic Victorian era design produced by a high-end French outfit, but let’s not quibble.) It is clear that “nobody is watching the back room of the new global store” and JBIII is going to do something about it. Not exactly a good guy/bad guy drama, the controversial John D. Bassett III is surely on a noble pursuit, wanting late in life to leave a good legacy, to care for one’s duties to place and culture and the people of a plant. JBIII knew the workers, after all, to his credit, and he cared about the design, and – multi-millionaire that he was – had the means to do something dramatic about it. This story of grit and resolve for what we might think of as a justice issue, and for civic flourishing, not just winning a scrappy business competition, is inspiring in a way my friend Steve Garber, in a very good chapter in Visions of Vocation: Common Grace for the Common Good, calls “proximate justice.” Who doesn’t love a come-back story, a (relatively) little guy with an inglorious past, stepping up and doing right by his people? Of course it isn’t perfect and it doesn’t solve the economic complexities of global trade. But it is a step. Watching this man character in Macy’s Factory Man is inspiring, even if it is “proximate justice.” It is a feisty, fun, story, and you’ll be rooting (along with the folks in the factory, their families, and those who live in the region) for him to succeed. What he pulled off was big, bold, and counterintuitive. He’d orchestrated the filing of what was then the largest antidumping petition against the People Republic of China – and won. And he’d done it from tiny Galax, Virginia, in a town better known for bluegrass and barbeque. The tale sounded fascinating from the moment I first heard about it, but like all stories, the deeper you dig, the more complicated and layered it gets. WATCH THIS GREAT 4-MINUTE VIDEO EXPLAINING THE BOOK, MACY’S PASSION FOR THE PEOPLE EFFECTED BY FACTORY CLOSINGS, AND HER FRIENDSHIP WITH THE MAIN CHARACTER. Factory Man: Paperback Release Video from Tom Landon on Vimeo. As I’ve said, Beth and I are unashamed Michael Perry fans, for his earnest but significant insight about rural life and small town people and their foibles and virtues, and for the way in which there is an intelligent and informed moral background, it seems, to his often very funny ruminations. So when we heard he had a new comic novel out, we both grabbed it, Beth finishing it first, and me taking it up not long after. We each had our favorite parts, thought this or that was incredibly funny or less so, and our choice determinations of what was plausible or over the top in this tale about life, love, faith, miracles, money, and beefers. Perry’s characterizations are a hoot. The main guy is Harley Jackson, sometimes accompanied by his hefty, blue-collar, philosophy-talking friend, Billy. (Whose recommendations and ruminations end up sounding a lot like stolen lines from the likes of Waylon Jennings.) There is Carolyn Sawchuck, a published academic who lost her university job due to unclear office politics (as a postmodern radical ecologist she ends up scamming locals with a fraudulent oil recycling project) and a greasy developer who listens to endless motivational tapes in his (about to be repossessed) Hummer – think maybe the failing lawyer in Better Call Saul, although I doubt that Klute is Jewish, or that smart. (He rails against those who are not “do-ers” and in one screed against the pedestrian town council says their low-level bureaucracy “gums up the gears of greatness.”) There is the free-loving, motorcycle mama who’s handy with a chainsaw that steals Harley Jackson’s heart for a bit. And the devout Catholic who runs her Daddy’s junkyard and winches broken-down vehicles from her tow-truck and quietly prays each morning at the struggling church and starts a food pantry for the people hit hard by the latest downturn of the economy. From episodes of in-house squabbles at the fire department (a thermal imager comes into the story) to the lovely scenes of farm chores, to what felt to me as very real blue-collar/single male foibles and longings, especially in their wanting to ask a woman out on a date, all of the descriptions were entertaining and the folks were endearing and, in an admittedly slightly caricatured sort of way, believable. And in walks the big time Hollywood big shot, the press agent that convinces Harley to sign the contracts to forfeit his rights to handle the showings of the Jesus Cow. (“You want to represent a calf?” Harley exclaims to the talent management executive, who explains to him how licensing and monetization work.) This is where the story goes over the top, but with just enough mentions of other real-life occasions of Marian visitations or holy grails being discovered or miraculous possibilities apparent in some renowned liminal place to keep it (almost) believable. Sure, this is a spoof of the big time marketing schemes and religious-paloozas, and surely is poking hard at evangelical revivalism and televangelists (and perhaps Catholic showboating shenanigans, too) but below the obvious satire, there is interesting stuff going on: witness the many plainspoken theological ponderings of Harley and Billy as they watch the glitzy carnival spectacle. As the money and fame keeps growing and growing they wonder, wisely, if they’ve made the right decision in exploiting this small-time miracle that they once tried to literally cover up with shoe polish. Harley wondered what his mother would have made of that calf out there. Jesus Christ had been her reason for living. And yet for all her devotion to Him, and to His Father, and their Holy Spirit, and to Sunday-morning meeting, to hymns and vespers, to prayer at every turn, hers was a quiet faith, uncomfortable with show or emotion. Silently she read her Bible every morning, silently she bowed her head over each meal throughout the day, silently she ended the day on her knees in prayer beside her bed, Harley’s father kneeling at the opposite side of the mattress, their very marriage bed bookend by worship. His mother’s creed – religion wise and otherwise – was pretty much: Let’s not make a scene. Once, when Harley was telling his lady friend, in a tender and honest conversation about his religious upbringing and why he doesn’t really pray much anymore, he explains how Billy taught him about the word theodicy, but his girlfriend thought he said odyssey. Such is the pillow talk in this clever satire. In one scene, Harley is trying to sluice out if there really are miracles, and if this particular bovine manifestation is one. And why so many pilgrims are flocking to his farm, convinced it is indeed a life-giving, faith-energizing sign from God. “Did you just say ‘spackle the gap’? If these guys lived a little further south in, in Milwaukee, say, or over in Saint Paul, I’d swear they could pass for Click and Clack from Radio Cartalk. The big, hilarious, and finally very moving ending of this tender story is one I can’t even begin to explain – it includes a wild ride into the bogs, and that thermal imager from the fire company, but I can’t say more. I think I can suggest that one of the primary themes in this entertaining yarn is a theme common to many of Perry’s essays, and common to the good folk of Bassett, Virginia, too: how can we find greater dignity in ordinary life, especially ordinary life that isn’t dependent mostly on high sensations from TV or shopping malls, but is decent and glad for daily bread, received as gift from a benevolent God (even after hours and hours of grinding, hard work.) And how can we maintain this classic, rural outlook in the face of modern progress boring down full speed ahead? That is, in many ways, a major theme of The Jesus Cow – especially as a fancy-pants developer is exposed as a pseudo-hero and the radical environmentalist is seen as less then helpful, all showing us that true progress must be measured in something other than dollars and cents or abstract ideas. From the all too real anguish of plant closings in the once industrialized South documented so well in Factory Man to the false dreams of the Clover Blossom Estates housing development in Swivel, and the fiasco of the Jesus Cow show itself in Perry’s over-the-top novel, much of what is promised as progress is not. And, in this fallen world, hard times, unlike the Woody Guthrie song, are in fact, going to come again some more. How do we endure? What is real heroism in a small, struggling town? In your life and mine? How does our own hubris – spiritual or entrepreneurial – deform our best efforts at being the salt of the earth? Factory Town and The Jesus Cow each in its own entertaining way, introduces us to rich examples of the forlorn human condition, good and bad, silly and sad, wise and foolish, up against forces bigger than ourselves. There are sinners and saints, in real-life Bassett and Galax in southwestern Virginia and in funny, fictional Swivel, Wisconsin. Or, we could say, as surely Harley learned in his Lutheran catechism class, if he were paying attention while eating his cheese curds, simul iustus et peccator — sinners and saints at the same time. These two books were really great reads, and, amongst much, much else, reminded me, at least, of that.